Samsung Galaxy Note 8.0 takes on iPad Mini with S Pen, Dual View and more | What Hi-Fi? Samsung has launched the Galaxy Note 8.0, an 8in tablet that comes with the S Pen stylus and a number of new apps and features. Joining the growing number of tablets at this new midway screen size, including the Google Nexus 7 and Apple iPad Mini, the Note 8.0 has a few tricks up its sleeve to seperate it from the crowd. The core specs are an 8in, 1280 x 800 resolution TFT screen, an impressive 1.6GHz A9 quad core processor and 2GB RAM, twin cameras (5MP and 1.3MP) and the option of 16 or 32GB of strorage. There's a microSD card slot, too, a whopping 4600 mAH battery, and the promise of a 3G model as well as a WiFi only model. Measuring 210.8 x 135.9mm, Samsung insists the Galaxy Note 8.0 can be held easily enough one-handed, even calling the device the "perfect pocket-sized hands-on tool". The S Pen, Samsung's stylus attachment also seen on the other Note products, comes integrated in to the Note 8.0 – simply pull it out to activate a host of S Pen specific apps. There are special versions of the popular Awesome Note and Flipboard apps (both on Galaxy tablets for the first time) that allow you to use the S Pen, while for the first time on a Galaxy Note device you can also use the S Pen to control the physical menu and back buttons. Samsung is a promising a better evolved version of the S Pen all round, with deeper integration thanks to features such a Page Buddy, which activates your most recent note when you remove the S Pen, and Pen Detection, which suggests better ways for you to navigate the Galaxy Note 8.0 when the S Pen is in use. 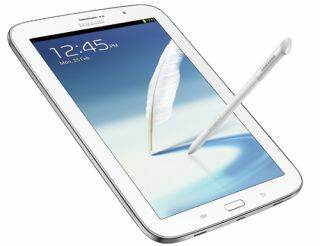 Samsung also looks to have improved a number of features first launched on the Galaxy Note 10.1 tablet. Pop Up Note and Pop Up Video use the multi-tasking feature to allow you to use the screen for more than one task at a time, say with video running on top of the web browser. Dual View splits the screen in two, again allowing you to make better use of the screen with multiple apps and features. There's a new Reading Mode, too, which automatically adjusts the screen settings for optimum reading conditions for eBooks, while Smart Remote allows you to connect and remote control your TV, set-top box or Blu-ray player, provided they're compatible. Also on the spec sheet is WiFi Direct, Bluetooth 3.0, Samsung's AllShare DLNA client, Google Play Store, Samsung Kies and Kies Air for wireless transfer of files and Android 4.1.2 Jellybean OS. The Samsung Galaxy Note 8.0 is due out in the UK in Q2 2013.